Could an invasion be coming? Last time I checked in things were looking pretty good in Connacht. There were feasts, and hunts, and fairs a plenty. It seemed all of my neighbors had a fairly good opinion of its ruler, Aed I, and we'd even managed to get some nice ambitions completed, all resulting in a decent amount of prestige being earned. With that, it seems like the game saw what was going on and decided, "Better not let this guy get too confident" and proceeded to beset my region with all manner of problems. Where to begin? 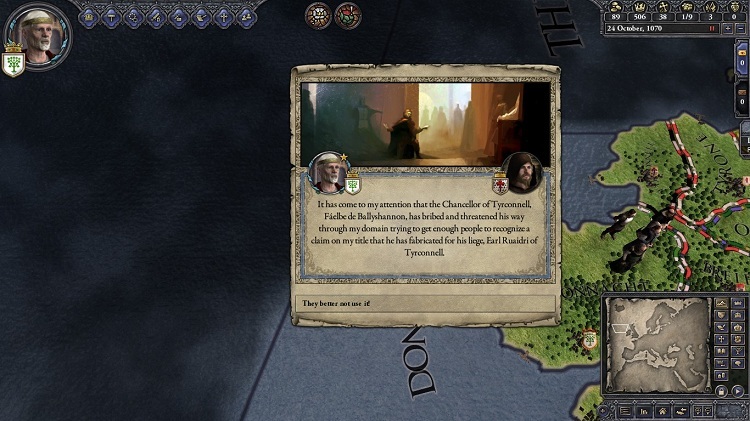 Hmmm, first, another neighboring region, Tyrconnell, decided to fabricate a claim on Connacht, which means there's a risk that I may be invaded at some time. I have my army training, but my forces aren't very large, so it may prove to be a problem if this guy marches on me any time soon. All I can do is try and keep my soldiers ready, and maybe see what I can do about improving the area's opinion of Connacht. 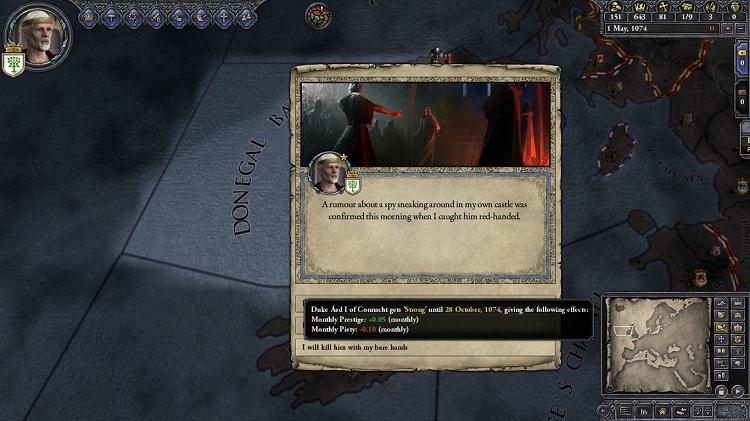 Not long after this Aed's wife died (of natural causes), and this proved to be a double problem because not only would I have to seek out a new wife for my duke, but I also needed a new spymaster. Filling this position resulted in a flurry of job shuffling in my council as I tried to find a suitable replacement. I had to go so far as to invite some new nobles to my court, but after about a year I finally had a number of new nobles that were very good at their jobs, and at last the spymaster position was filled for the long haul (I hope!). The council even got a couple of new members that were particularly skilled to take on the roles of steward and chancellor. you turn heretic on me. This is just the tip of the iceberg, though. Next came the matter of remarrying Aed, and this took a surprisingly exhaustive search of eligible lasses from across Europe. Eventually I opted for a young lady from Burgandy that's about one third his age (scandalous! ), and they seem to be getting along well enough. They've even managed to have a daughter together, which made for a nice additional boost of prestige since I made that an ambition for Aed. Unfortunately, though, all of that hunting has finally caught up with the old duke, as he managed to wound himself quite badly on his last expedition. It came from a run-in with a bear. Thankfully he didn't die, but he did take a beating. So, no more hunting for him. He'll just have to settle for summer fairs and the occasional feast. The final bit of adversity to hit Connacht came when my bishop tried to convince Aed to convert to Fraticelli, a heretical take on Catholicism. 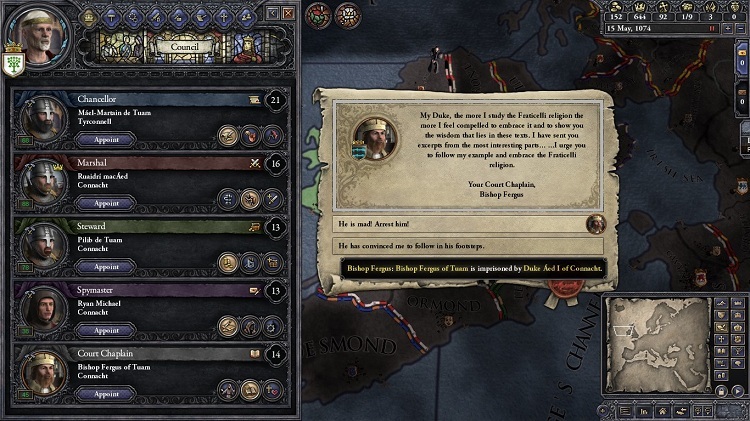 Of course I had the guy imprisoned immediately because the last thing I want is a heretic ruler, as I suspect that will put a big target on my region with people near and far plotting to invade it and reinstate the Catholic Church. Sadly the bishop died in prison a year later, and he's been replaced in my council with a new holy man (who has some pretty amazing stats, hedonism not withstanding). So things have gone all topsy turby in a little over five years for my little corner of Europe. We're still throwing our parties but it's hard to ignore the looming threat of a potential invasion from Tryconnell, the loss of Aed's wife, and his bishop suddenly turning heretic. Things have started to take a turn for the worse, but now I guess it's up to me to get things back in order, and ensure that Connacht becomes the hippest, most happening place in all of Ireland. Part III is over here.